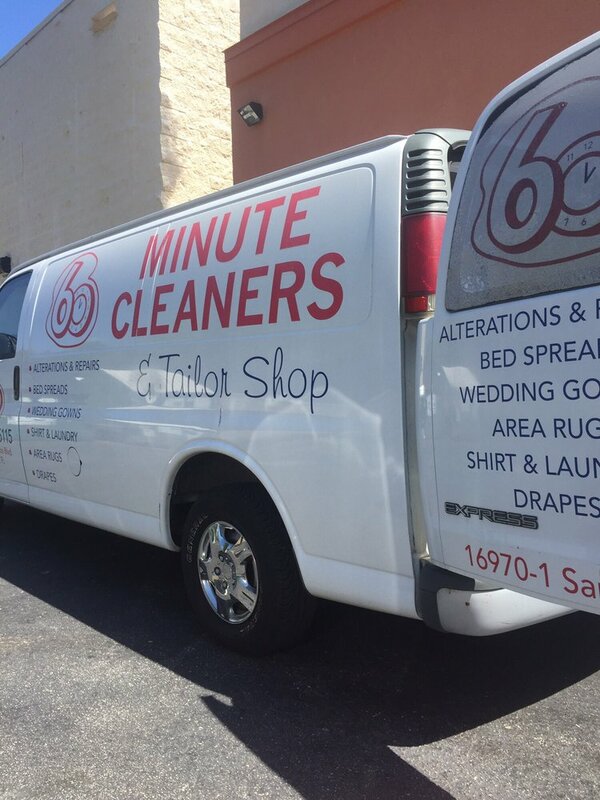 60 Minute Cleaners and Tailor Shop is ready to handle the garment cleaning and tailoring demands of customers throughout Fort Myers, FL and the surrounding areas. We offer a full scope of washing and cleaning services, along with stain removal, wash and fold service, and alterations. We work quickly, to make sure you’re getting your clothing back same-day, or even within the hour! The Quickest Cleaners in Fort Myers, FL! The next time you need to visit dry cleaners in Fort Myers, FL, take a moment to consider everything 60 Minute Cleaners and Tailor Shop has to offer. Our 2,000-square foot facility is equipped to perform just about any type of garment service you might require, including dry cleaning, laundry service, tailoring, and cleaning of everyday household objects such as area rugs, bed spreads and comforters. What’s more, not only do we offer comprehensive cleaning services—we do it faster than any other laundry service in Fort Myers, FL! If you drop off your clothing at our location by 11am, you can expect same-day or even within-the-hour service from us! We know you don’t have time to wait around on your dry cleaning, which is why we’ll never make you wait longer than is absolutely necessary to clean your clothes to perfection. Our shop is backed by more than three decades of professional expertise. This means that we don’t turn customers away, we don’t close unexpectedly for maintenance and we never lose your dry cleaning. Moreover, we get to know our customers on a first name basis. This allows us to develop a relationship you can count on. We want you to feel at home when you visit us and trust us implicitly with even your most delicate clothing items. In return, we’ll set ourselves apart by never letting you down and always providing commendable service. Whether you need general dry cleaning, stain removal or the oversight of an experienced tailor in Fort Myers, FL, you’ll find it here. Let us show you how quickly we can earn your business for life. We’re red wine stain removal experts. We’ve been in the business for decades and have perfected the removal of even the harshest spots and stains. Our tailoring and seamstress services can also extend to leather and suede repairs, upon request. We clean and repair American flags completely FREE of charge! Our location features a drive-thru window where you can drop off or collect clothing without ever having to get out of the car. Our 11am take in time is the latest around, meaning we work quickly to get your clothing back to you same-day. For the quickest turnaround and best results in the laundering and dry cleaning industry, make sure you’re choosing 60 Minute Cleaners and Tailor Shop. Ask about our services today!